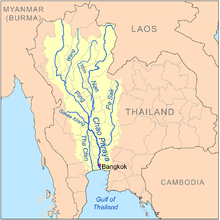 The Ping River (Thai: แม่น้ำปิง, RTGS: Maenam Ping, pronounced [mɛ̂ː.náːm pīŋ]), along with the Nan River, is one of the two main tributaries of the Chao Phraya River. It originates at Doi Thuai in the Daen Lao Range, in Chiang Dao district, Chiang Mai Province. After passing Chiang Mai, it flows through the provinces of Lamphun, Tak, and Kamphaeng Phet. At the confluence with the Nan River at Nakhon Sawan (also named Paknam Pho in Thai), it forms the Chao Phraya River. The Ping Basin is one of the largest drainage basins of the Chao Phraya Watershed, draining 33,896 square kilometres (13,087 sq mi) of land. The greater Ping Basin, i.e. the basin of the entire Ping river system including its tributary the Wang River, drains a total of 44,688 square kilometres (17,254 sq mi). The main dams in the basin are the Bhumibol Dam and the Doi Tao Dam. The Ping itself originates in Huai Nam Dang National Park and flows through Mae Ping National Park. Bhumibol Dam, 154 metres (505 ft) long, creating a reservoir with a surface area of 300 square kilometres (120 sq mi). ^ "Chiang Dao National Park". Thai Forest Booking. Retrieved 2009-05-20. ^ "Mae Ping River: Lifeline of Chiangmai Province". Chiangmai and Chiangrai Magazine. 2008. Archived from the original on 2009-11-29. Retrieved 2009-04-02. Wikimedia Commons has media related to Ping River.